Note that the digital download version looks like this. It has exactly the same tracks, but in a sightly different order! 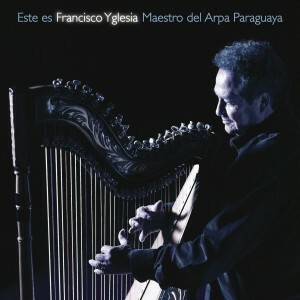 The definitive Paraguayan Harp album! captured in the finest audio quality. NOW AVAILABLE ON COMPACT DISC – CLICK HERE! 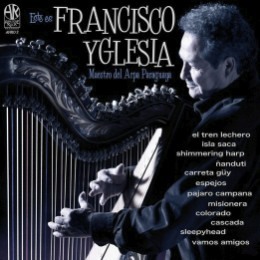 Recorded in the summer of 2009 at St. Thomas’s Church, Stockport, England, “Este es Francisco Yglesia” showcases Francisco, and the Paraguayan harp, like neither have been recorded before. He plays all 12 tracks live, solo & unaccompanied, and they’ve been captured in pin-sharp high fidelity. The track selection features all of Francisco’s hits and favourites. It is a mixture of traditional Paraguayan and other Latin pieces (including his signature ‘Pajaro Campana’), plus several of his own striking compositions (not least the often-covered ‘Vamos Amigos’). Also included is a mesmerising acoustic re-recording of ‘Shimmering Harp’ from his debut 1982 album of the same name, and an all-new cover of Passion Pit’s contemporary and evocative “Sleepyhead”.